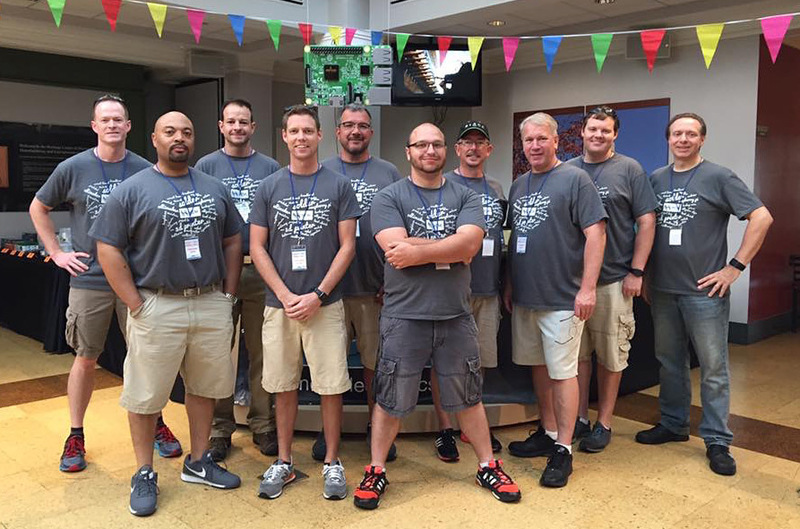 The inaugural Dayton Maker Faire is in the books. 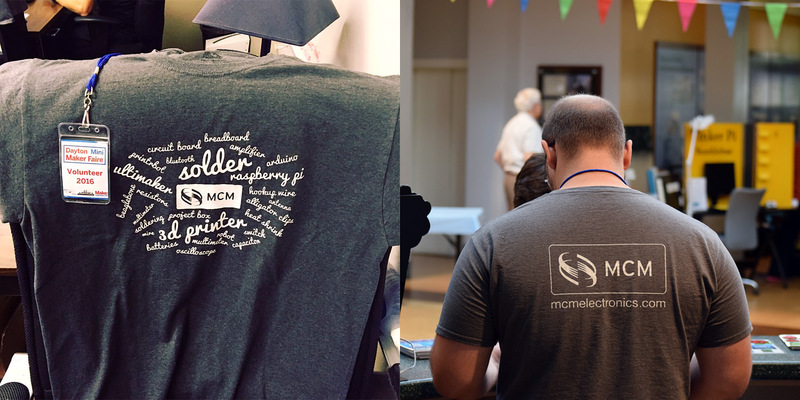 Both Real Art and MCM Electronics put a huge effort into making the event a memorable one. 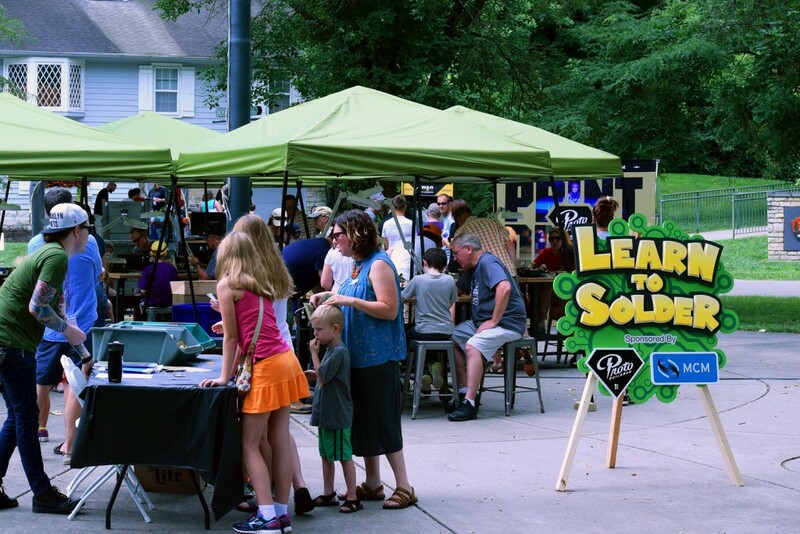 There was plenty to do for folks of all ages, from learning about various different types of art, to taking part in activities like learning to solder. Both companies had an amazing number of helpers, which worked as a team to man their various activities. Personally, I had a lot of involvement as well. 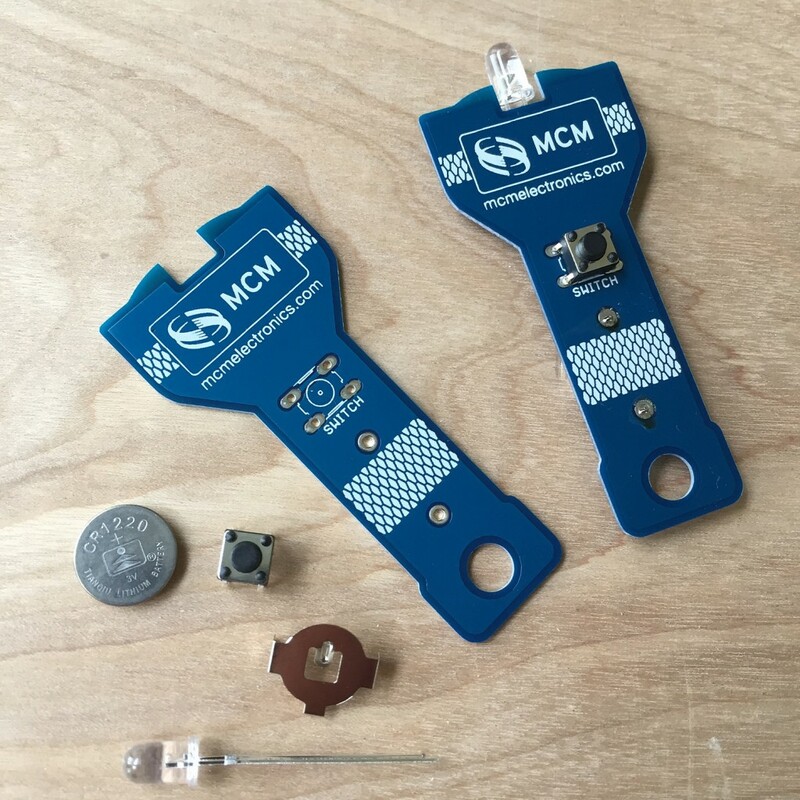 Michael and I designed a simple flashlight-shaped PCB for the patrons of the Learn to Solder booth. He then had 750 made specifically for the event. 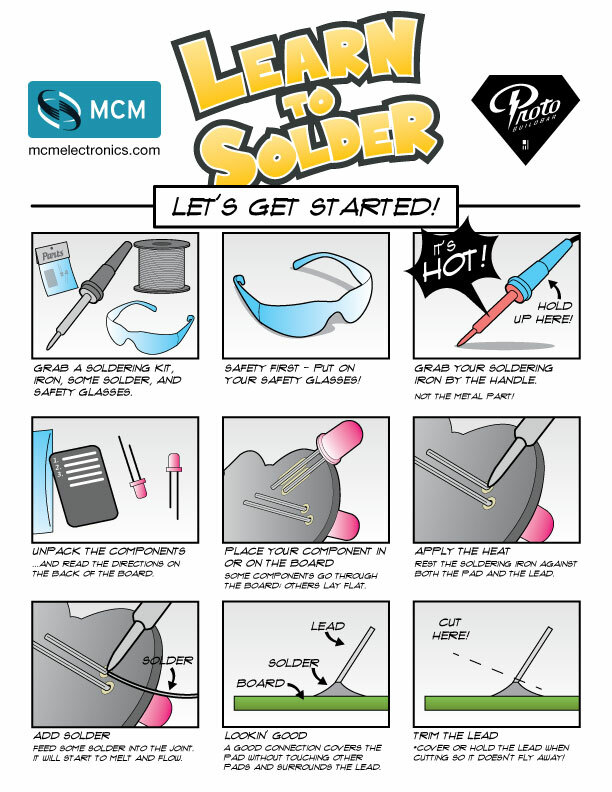 I spent a lot of time pre-event creating signage for the Learn to Solder booth, as this was the attraction that MCM was most involved with. Here is the main 4ft x 4ft sign for the area. 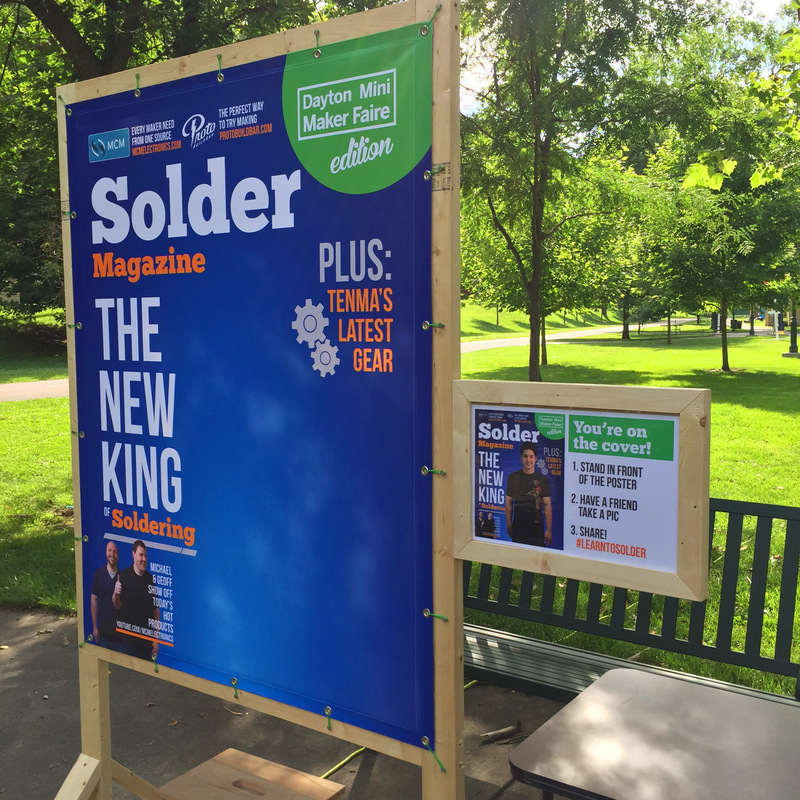 I also designed and created a huge “Solder Magazine” cover so that participants of the Learn to Solder booth could take their picture in front of it as a keepsake, and share with their friends. A stool was provided for the tikes. This was a last minute addition, but it seemed well received by the attendees. 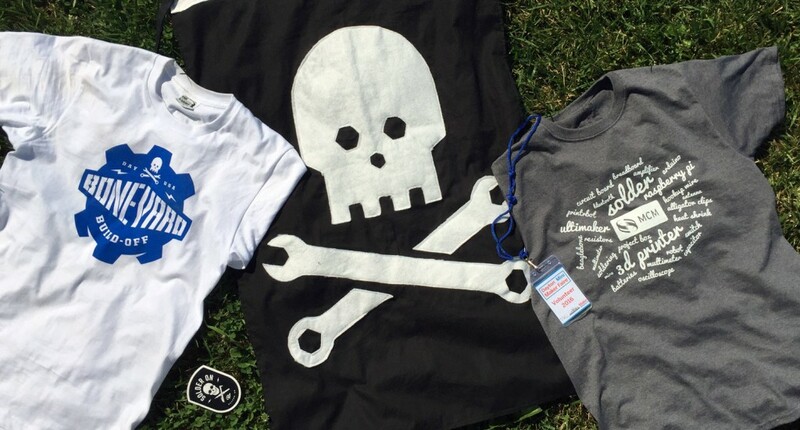 Additionally, Greg and I designed and screen printed tees for the entire MCM staff. The day of the event was a blast! 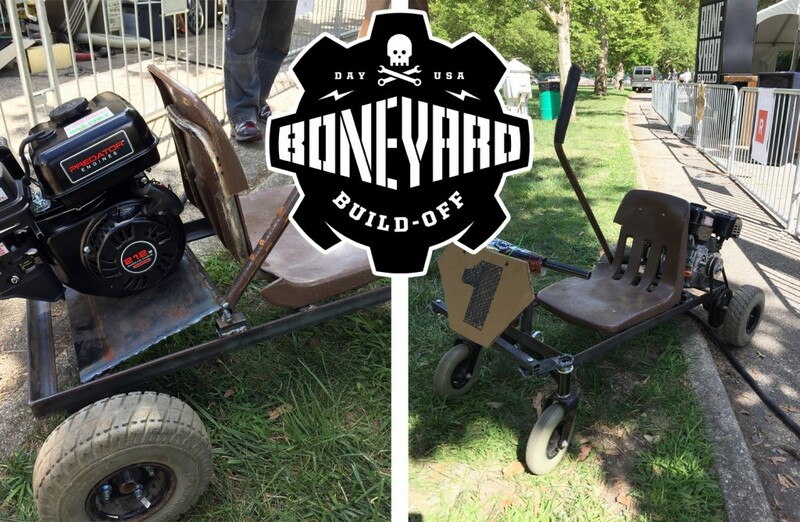 Michael and I had been invited to participate in the Real Art Boneyard Build-Off; an event that pitted two teams against one another with the goal of building a vehicle that would be speedier, look better and be able to pull a heavier load. This event began at 10am and went through 4pm, where the two finished vehicles paired off against each other in a head-to-head competition. Sparks flew on the way to assembling a working vehicle from piles of junk! The build took the entire 6 hours. 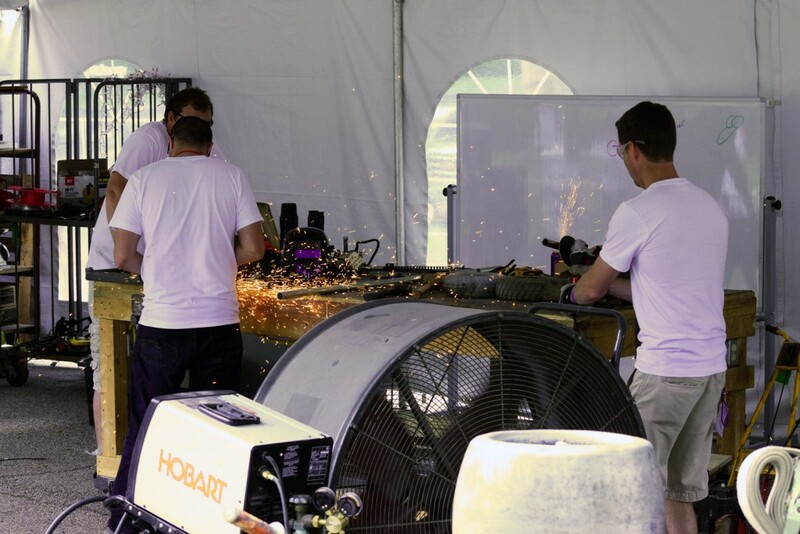 Our team, also including Air Force Research Lab’s Mark Carroll and David Wirth, worked incredibly hard to brainstorm, strategize, cut, weld, bolt and build the cart. 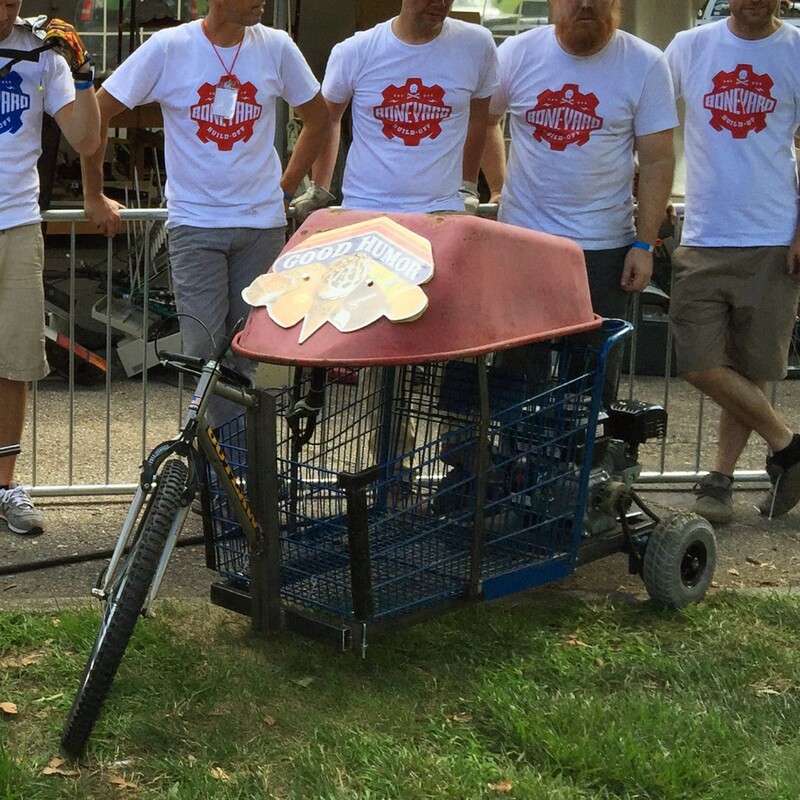 At race time, the Real Art kart wielded a full grocery cart roll cage complete with a wheelbarrow lid. It also had amenities like a brake, and driver-operated throttle control. They were able to use a chain-driven system due to the centrifugal clutch that was mounted on their engine. The driver-operated throttle controlled the speed of the kart. The MCM/AFRL entry featured a bare-bones approach. After all, brakes and safety gear adds weight. And slowness. We used a belt driven approach. The motor ran at full throttle all the time. The kart moved when we tensioned the belt, which acted like a clutch. Four wheels, instead of three, added stability. Sort of. The MCM/AFRL entry. Our kart engaged the motor with a lever system. When the driver pushed the lever, it lifted the engine plate and tightened the belt, engaging the live-axle powa! The steering was a pitman arm-type system. We ultimately took down the Real Art entry in both the speed and tractor pull competitions. 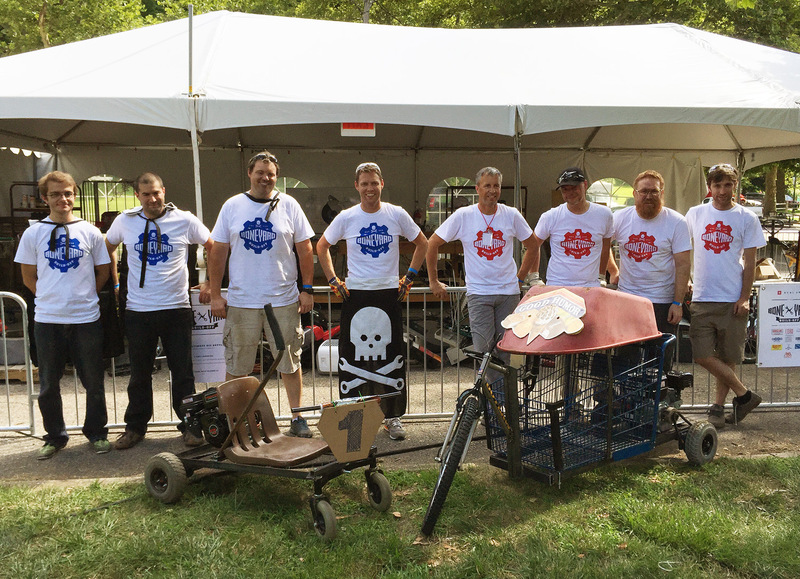 It may not have been as pretty as the other entry, but the belt-driven cart was good enough to win two of the three challenges for the overall win, netting the MCM/AFRL team some sweet capes and bragging rights as the king of the first ever Boneyard Build-Off! No one really wanted to pilot our kart. I guess I lost the bet, but no one got hurt, and it all worked out in the end.